Common damage caused by Raccoons in the attic include torn insulation, chewed electric wires and odors from their excrement. If you suspect Raccoons are in your attic, then it's time to evict them! If these animals are active in your yard, they will tear up your grass, destroy bird feeders, raid your trash cans or live on pet food. Their natural predators are nonexistent in cities or metropolitan suburbs, Raccoons have populated excessively. This has led to more of them carrying the rabies virus. Raccoons are the most likely carrier of this virus in many states across America, besides posing a health threat to pets and humans. 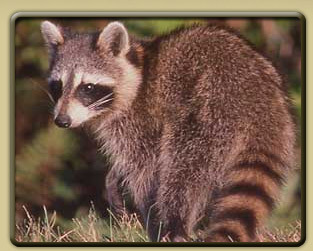 Raccoons \ra-'kün\ Common backyard “bandit” that is easy to spot with its black facemask and bushy, ringed tail. Raccoons breed from February to early March. Mothers carry the unborn raccoons for two months before giving birth. The mother will have 1 to 7 raccoons or kits in her litter. Raccoons are born without teeth and their eyes are closed. Young raccoons are taught how to eat by their mothers beginning when they are about eight weeks old. The father raccoon does not help raise the kits.